The active carbon filter, also called activated charcoal filter or activated coal filter, is a kind of water treatment equipment that utilizes the absorption of active carbon to purify water. The machinery is made of stainless steel. The husk activated carbon inside the filter can absorb the solvable impurities in the water, and effectively wipe out the organic matter, chemical hazardous substances, and chloride ion in water, which can protect RO membrane from being damaged by free chlorine and remove off-tastes and odors, thus improving the water quality and taste. The organic matter density is less than 1mg/L. 1. 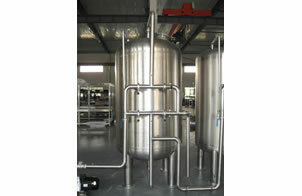 The equipment is a kind of stainless steel active carbon filter with diameter of 600mm. The husk activated carbon inside the filter can absorb the solvable impurities in the water, and effectively wipe out the organic matter, and hazardous substances in water, thus reducing COD content. The filtering layer height is usually more than or equal to 1200mm. Under normal working condition, the total water output is 4m3/hr, and the effluent quality is less than 4. Founded in 2006, our company is a leading manufacturer and supplier of active carbon filter in China. Here in Topling, we mainly offer water filling line, juice filling production line, carbonated drink filling line and related equipments including external brush washing machine, sodium ion-exchanger, water treatment equipment (water filtration sterilizers systems), and other related machines. We offer installing and debugging services of our devices and staff training for factories abroad and OEM service. For more guides of active carbon filter or our other production lines, please contact us. Sodium Ion-ExchangerThe sodium ion exchanger that uses sodium ion as the exchange ion is sodium ion-exchanger.